As I grew up and into my thirties I sang in choirs where I learned to breathe for a specific purpose. Using my breath, controlling it, being conscious of it, became part of the action of singing. Yet in all other parts of my life, I ignored my breathing. It just came and went as it would, without me being consciously aware of the magical process which keeps me alive. It was easy to breathe and live in this way, without awareness that I was breathing. Easy because it happened automatically and easy because our breath and our emotions are connected. My habit of shallow breathing allowed me to live my life avoiding feeling anything too deeply. This practice of conscious breathing grounds me, opens my body to emotion, allows me to identify what I am feeling – and feels great. When I breathe deeply, I am more alive, more present and more in tune with my whole self. One of my teachers. Barbara Carrellas, describes Tantra as “breathwork with add-ons”. In other words, all that we experience in Tantra starts with the breath. Take a breath now. A deep breath, with your stomach relaxed and open. Breathe in and as you do, imagine your breath coming up from the earth, between your legs (your base chakra) and up into your heart. Exhale back down your body from your heart to your base. How does it feel to breathe deeply? Do you experience more sense of you, more aliveness? Sensations in your body. If so, then welcome to the world of breathwork/play. If not, then try again another time. 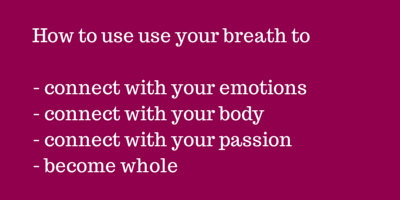 It can take a little practice to discover the effects of breathing. My suggestion: set aside a time each day to practice deep breathing. Five minutes at any time of the day will show you the benefits of conscious breathing. Many of us live most of our lives in our heads. Analysing every part of what we do. Telling ourselves stories which make sense of the world. Wondering what others will think of us. Trying not to feel too deeply by filling with words the space which might allow emotions in. The invitation of breath is to drop the thoughts which crowd the mind and to feel what is in our body. To be open to our emotions and desires. To allow our heart to inform us. To enable us to open us to others. When we breathe deeply and consciously, we start to feel what is inside. Whether these feelings are painful or joyful, angry or loving, we learn to accept all these feelings as our truth. In Tantra, we learn to use the breath to move energy through our bodies and through the chakras. We use breath to heighten the sensation of touch, to expand our sexual energy so that it infuses our whole body, to deepen our connection with ourselves. We bring breath and our energy into our connections with others, allowing ourselves to interact with the other’s energy and to be fully present with them – our thoughts, emotions and sexual energy focused on the connection. In that space, we can experience profound closeness and heightened sensations of pleasure. Now, take a breath. And exhale totally. Enjoy yourself. What is your experience of using your breath to connect with your body and your emotions? I’d love to hear your stories.